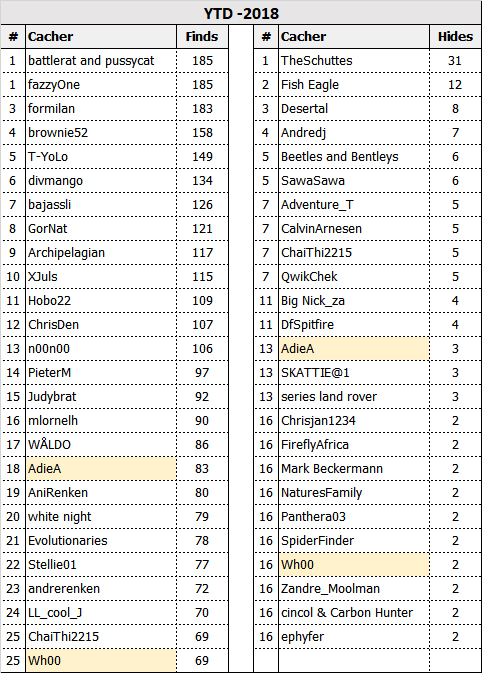 50% of all the finds were logged by the top 2.5% of cachers. 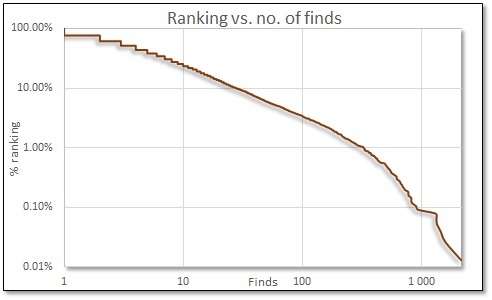 84% of all the finds were logged by the top 20% of cachers. 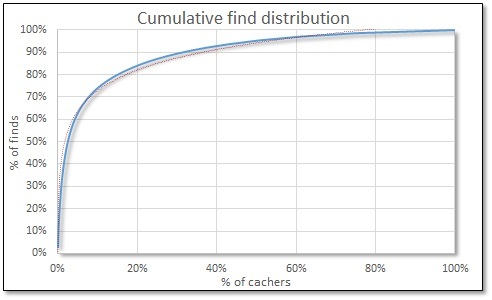 The bottom 50% of cachers only logged 4.8% of the finds. 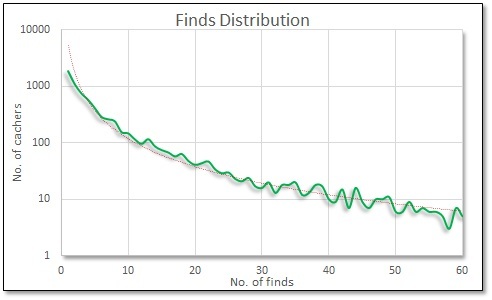 The last 1% of finds were logged by the bottom 18% of cachers. 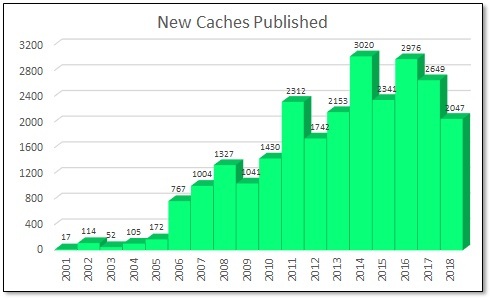 A full 1902 cachers (24.9% of the total) only logged a single cache. The average number of caches found was 18.1 per cacher, and the median was 4. A total of 7649 cachers logged at least 1 cache in South Africa during 2017. (20% fewer than in 2016). 1644 cachers (21.5% of the total) logged at least 12 caches during the year; my arbitrary definition of "active" cachers. (6.9% fewer than in 2016). So the 80/20 role applies. Is it possible to match hides vs finds for the year by cacher. 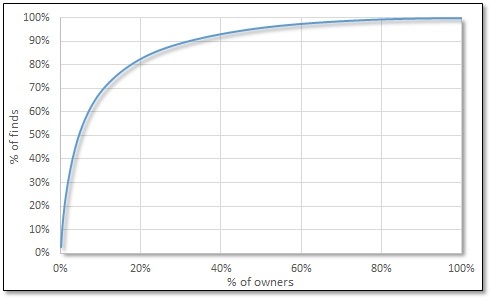 Yes the 80/20 (Pareto) principle pops up everywhere. Yes, I can match hides and finds per cacher, but what do you want to see? Best karma? 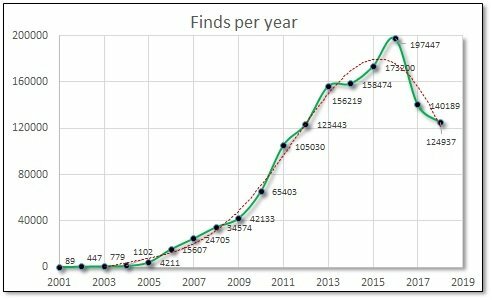 I don't think many people have logged more than 2000 finds in one year; I'll look into this later. These are valid for all starting dates, not only 1 January. Would be interesting to see karma for the year - top and bottom 10. We should revisit these numbers later in the year. I personally don't have an issue with certain "big number" finders having few hides. It would be nice to have them hiding - but each and every one of us plays the game in the way it works for us. Western Cape will remain the primary destination (tourists both international and local) - plus there are AWESOME cachers in the area - and some brilliant caches. I love caching there - and I'm a true blue Natalian. 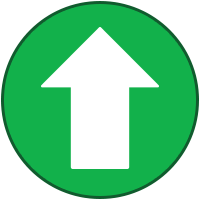 We all just need to co0ntiunue encouraging new cachers and placing new quality caches. The western Cape also lends itself to a more outdoorsy lifestyle. Canary Islands got 60000 odd more finds for 2017! That is huge. I really hope we reverse this trend - it's good to be the biggest in Africa. Alarming that 1902 cachers only logged a single cache (even if you half that for tourists) - it means new cachers don't see the point - QUALITY caches are the key to keep us old folks interested and attract newbies. 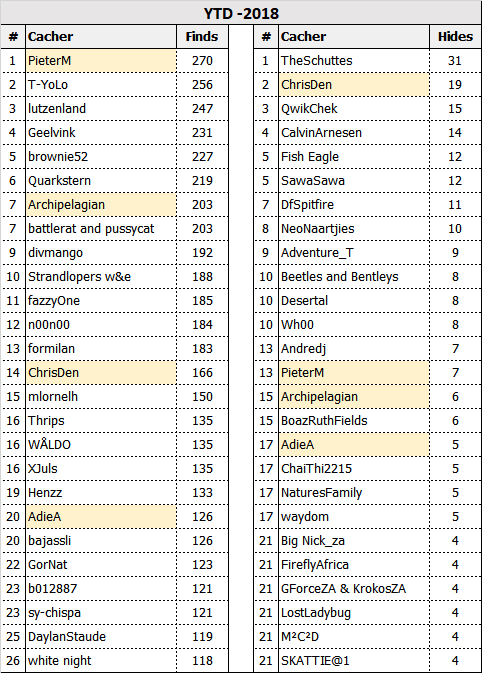 While an average finds of 18 caches sounds good - the median of 4 is bad - it means the large numbers of guys like geelvink and the others - are overshadowed by the huge numbers who do not change into regular cachers. We need to see new faces! Just over 2 finds a month (28) places you in the top 10% of cache finders in SA!!!!!! 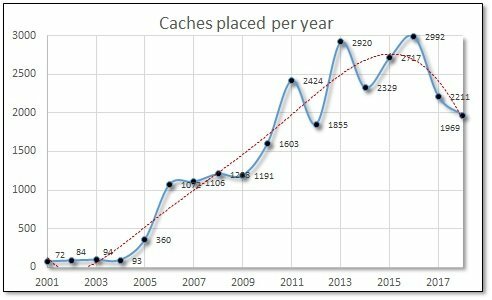 Very alarming on cacher "stickiness"
We are having many many caches archived each year - agreed some may be archived too soon - but maintenance needs to be kept up on caches placed - or good quality caches that last need to be placed. I agree with the point about recruitment. When we started it was like a secret society. If someone asked what you are doing you would think up some stupid excuse. We now tell muggles we are part of a world wide treasure hunt. Some loose interest when you tell them you don't win anything but some are interested. We need to be more open about our sport and get more involved. This should be read with part 6. That's about 4500 newbies - or fringe players - take 1/2 away for tourists and we still end with well over 2000 local cachers with potential to grow into the next geelvink or PieterM - there are some awesome "new" cachers of just over a year or so who now have 1000+ cache finds - we need to grow more of these - even if they only convert to a 100+ finders per year. It would be interesting to follow these stats as the year progress. Could it possibly be done monthly? Thanks, will be interesting to see how things develop over the year. Thanks for the update. Interesting to follow the progress. Looking forward to the next instalment to see how the Planetary Souvenir chasing effect the stats. Love this forum! A job well done! 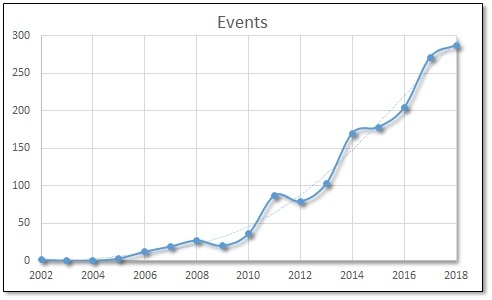 The 100th QC event was recently held. The first of these was in Feb. 2010; one every month, all in Pretoria and Centurion. A total of 197 cachers attended at least one of them. 100 months in a row, without ever being on leave, ill, or otherwise occupied; remarkable! To put this into perspective, iPajero's 16092 finds is 1004 more than the current number of active caches in South Africa! 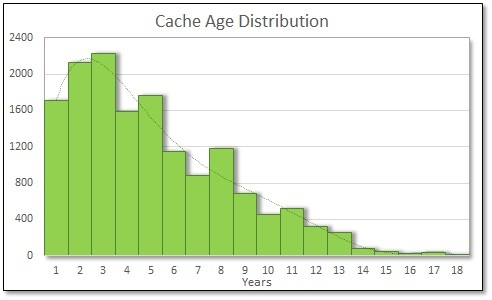 The fact that there are more 3 year old caches than 1 year old, is cause for concern. 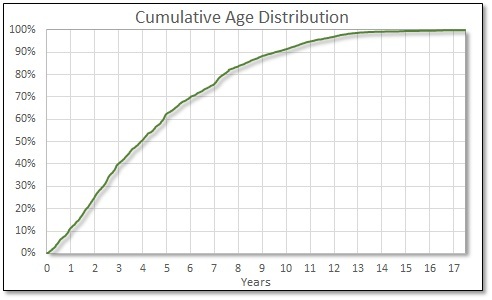 What this graph means is that 20% of caches are younger than 1.7 years, 50% (the median) are younger than 3.9 years, 80% are younger than 7.4 years, etc. The average age of all active South African caches is 4.6 years. The oldest 1% are older than 13.3 years. The oldest 100 are older than 14.2 years. The oldest 25 are older than 16.5 years. This year is 32% down from the peak in 2014. Once again - a brilliant set of stats. thank you. We have just come back from a trip to Mpumalanga. What we enjoyed was the caches that were placed along a scenic route. Regardless of the nature of the cache . There are plenty in Barbeton/Nelspruit/White River. I just wish there were more places like that. This is a very interesting chain of comments. Thank you for all your efforts Danie Viljoen. I am new here so I am not sure I post in a good place but perhaps you can help me somehow? this is my previous post that I published somewhere else. I am interested in geocaching statictics for Africa, particularly which country has the biggest/smalles number of caches. Is there any country without a cache.? Which country has the highest number of active geocachers ? Is there any country which has more ECs or mysteries than any other? Do you know if there is any place/website where I can see this statistics? Also is there any website with some trivia/ fact&figures about geocaching in Africa? 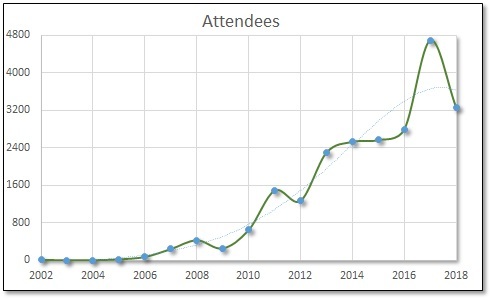 I would like to get the info as I am preparing an event dedicated to geocaching in Africa and I want to make it as interesting as possible. 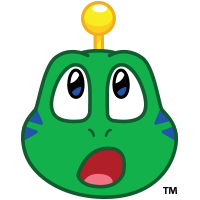 All of these questions have been answered before in this (or the old) statistics thread. I suggest you read through it; you may find other statistics that you can use. I echo Sokkies73 sentiments 😀. 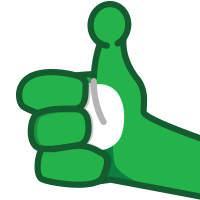 Hope we can see some new posts from the stats guru soon 🙂. I'm especially interested to see whether there was a significant different in finds during the souvenir periods this year - did the Planetary Pursuit, Hidden Creatures and the You might be a geocacher if promotions have any effect? 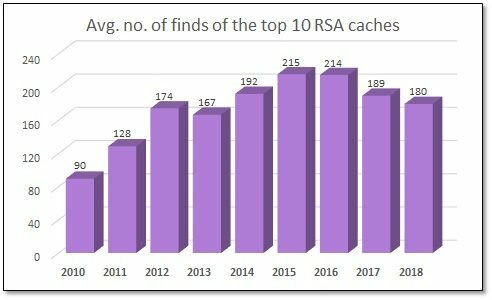 1969 new caches were placed in South Africa during 2018, 10.9% fewer than in 2017 (and 34.2% fewer than the peak in 2016). This is an average of 5.4 new caches per day (vs. 8.2 per day in 2016). Ek weet dis moeite en neem tyd maar ek sien uit na nog statistieke. 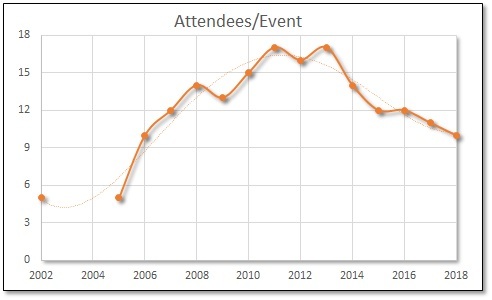 Another depressing picture - during 2018 124937 caches were found in South Africa, 10.9% fewer than in 2017, and 36.7% fewer than the peak in 2016. The following graph shows the number of finds for each day of 2018 (red dots). The peak was 2172 finds on 1 October. It is interesting to note that this was not the date of the 2018 Jolly Jozi Jol mega (which was 2 days earlier). There were large numbers of finds on the Black Eagle GeoArt caches on that day; presumably these were logged by mega attendees. 1 October was only the 13th best day ever; the all-time record was 6759 finds on 23 July 2011. The fewest finds last year was 61, on 24 May. The average number of finds per day was 342, and the median was 233. The green line represents the rolling average over a week (to filter out the week-end effect), and the blue line is the same as the green, but averaged over the last 5 years. If you compare the blue line with the green line, you should be able to see when there were above average numbers of finds. The souvenir periods do not seem to have had much of an effect; maybe around the beginning of April. Traditionally the school holidays had by far the largest effect on the number of finds. You remain the guru - thank you - this is very valuable and interesting information. Very interesting information indeed. On 1 October 2018 we were a group of 6 Capetonians that attempted/did our 400 finds per day, which also contributed to that huge spike on the day. 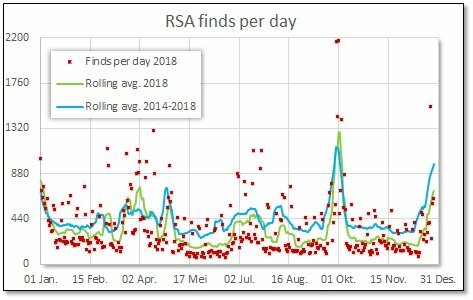 Wow - only 200 finds a year - I'm sure this is also lower - even on a cache like Table Mtn - can you plot maximum (or perhaps "mode or average" for the top 10 caches over the past few years? I'm sure this is also significantly down? See it's gone up slightly with 179 logs on the cache page. Yip, unfortunately the attendance was quite low compared to the 530 will attends. However, this was not out of the ordinary - CT Mega 595 will attends, 218 attended, KZN Mega 326 will attends, 177 attended. The first Mega was by far the best - 244 will attends, 212 attended.